It is well known that musicians, actors, politicians, scientists, royalty, sportsmen and all kinds of famous people, live in different cities of the world in their perfect clones, in real size and in the most diverse pose, for the amusement of everybody who visit the famous wax museums. The wax museums are not new phenomena. This technique has hundred of years, but has always being an object of curiosity, education and entertainment until nowadays. 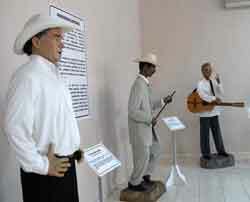 In Cuba, the first gallery with wax figures was opened the 14 of July 2004, in a small place of the General García Walk, in the eastern city of Bayamo, an important city for its national history. Three years later, the 29 of December 2007, this gallery became a true museum, located in a new building of the same street. An important number of wax pieces are on exhibition there. Most of the pieces are reproductions of Cuban birds and reptiles, which are located in a hall specially dedicated to natural sciences. This warm Wax Museum exhibits important popular characters of the Bayamo region, such as Francisco Jerez, a tireless defender of the local history, who was very worried all his life for preserving the historic city of Bayamo and who was known as Paco Pila. There is also the figure of Rita la Caimana, a singular character of the area who became famous thanks to the letter of a famous song of the popular duet Los Compadres. Each one of the pieces of the permanent exhibition are made in natural size and were modeled in polychrome wax by the young brothers Rafael and Leander Barrios, together with their father and teacher Rafael Barrios Madrigal. The curious wax pieces, made by the Barrios family, became famous among the local people of their native Guisa area and also among the tourist who went to that nice mountain area of the Sierra Maestra, at the beginning of the 1990's. They created the wax bust of the US singer Nat King Cole, which is decorating the Hall of Fame of the Hotel Nacional de Cuba in Havana. The sculptures of prestigious musicians, such as Benny Moré, considered one of the main Cuban composers and singers and known as Bárbaro del Ritmo (The Great of the Rhythm), Compay Segundo, Polo Montañés, known as Guajiro Natural, Sindo Garay y Carlos Puebla, great guitar player and singer of different creations with political and social content are very appreciated in the museum, for the shocking precision of the creation. The image of the young Italian Fabio di Celmo, victim of terrorism against Cuba is also very popular, mainly among the young people. Giustino di Celmo, father of the young martyr, sent from his home land a football outfit, his son had and which is today carried out by the replica. Since its opening ceremony in 2004, the installation is working under the name CERARTE and since that moment on, has had over 500 thousand visitor, becoming, therefore, one of the most attractive places in the city. The figure of Bola de Nieve, unforgettable Cuban musician, is the new work which will be added to the collection. Bola de Nieve will be seating together with his inseparable piano. The Wax Museum with biggest history and quality in its representation is the Madame Tussauds Museum in London.